Cyclists in a number of cities will benefit from a £7 million government investment in projects to improve road safety, helping create more bike-friendly areas. The funding has been announced as part of the Department for Transport’s cycle safety review, which will help ensure that our roads are as safe as possible for all who use them. Eight cities, which the government has already been helping to lead the way in promoting cycling, will be given the chance to bid for an additional £6.5 million of funding to trial new schemes which improve safety. This will support the government’s aim of encouraging more people to cycle as part of everyday journeys. The remaining £0.5 million will be set aside to support Cycling UK’s Big bike revival — a successful initiative which is helping to get more people cycling safely and confidently across the country. "Everyone should be able to take advantage of the huge health and environmental benefits of cycling. "While Britain has some of the safest roads in the world, we want to encourage more people to take up cycling. This funding, as part of our overall cycling and walking strategy, will help local councils to make their roads safer for everyone." "Last year the big bike revival reached more than 50,000 people in England, and produced more than 6,000 regular cyclists, so the project represents incredible value for money. "I’m delighted that the Department for Transport has recognised its significance by funding it for another year so we can get even more people cycling every day." This announcement is part of a drive to ensure that everyone across the country feels safe when cycling. 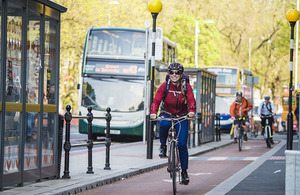 It will be up to local authorities to decide what sort of schemes to bid for — the Department for Transport has invited bids from the 8 councils and will be looking to support schemes which improve safety for cyclists, and which also deliver benefits for pedestrians. Jesse Norman made this announcement on a visit to see how government funding has made cycling in Bristol easier and safer, helping increase the number of people who cycle in the city. The Department for Transport launched the first ever statutory Cycling and walking investment strategy in April 2017, to encourage more people to cycle and walk. This sets out how the government will deliver its ambition for cycling, and outlines how the £1.2 billion of funding available over the period to 2021 will be spent. The cycle safety review was launched in September 2017.